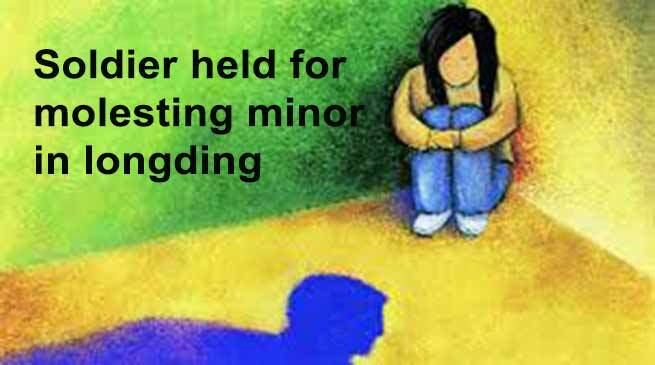 A minor girl (age 10) was sexually molested by a soldier Gurlal Singh of 19th Sikh Regiment, currently posted at Pongchau circle, Longding district of Arunachal Pradesh . The soldier has been arrested by the police on Thursday for allegedly molesting a minor at Bonia village under Pongchau circle here. According to the FIR lodged by the minor’s mother, the incident occurred at around 10 am on Thursday when the accused entered one house to use the toilet. There was no one in the house except a 10-year-old girl whose mother had gone to the neighbour’s house for a while. He allegedly grabbed the child’s hand forcefully and tried to molest her. However, the child screamed and managed to run to her mother in the neighbour’s house. The police later arrested the accused from the spot. Meanwhile, Pongchau PS, Inspector A. Chama has informed that a criminal case has been registered under section 354IPC read with section 10 of POCSO Act 2012. “The police have also managed to pacify an angry mob which had gathered at the town following the incident”, Chama informed adding that the accused has been produced before the Longding Judicial Magistrate First Class, who has issued order to transfer the case to the court of the District Session Judge, Tezu.